Coin collectors can look forward to another flavor of American Silver Eagles. The United States Mint in 2016 will commemorate the 30th anniversary of the first issue of the coins with numismatic editions that have smooth edges with lettering instead of reeded edges. Since their introduction in 1986, American Eagle silver coins have had reeded edges, like shown above. In 2016, proof and uncirculated versions will have a smooth edge bearing lettering incused with a designation that notes the 30th anniversary of the first issue of coins. Mandated under the FAST Act, which President Obama signed into law on Friday, Dec. 4, lettering incused on edges of proof and uncirculated American Silver Eagles will designate them as anniversary issues. "The United States Mint is excited about the 2016 American Eagle silver proof and uncirculated coins mandated by the Fixing America’s Surface Transportation Act," Tom Jurkowsky, director of the U.S. Mint’s Office of Corporate Communications, told CoinNews in an email. "The edge lettering required by the Act is a fitting tribute to the 30th Anniversary of the world’s most popular silver coin." Jurkowsky said that the U.S. Mint will use new, special tooling to produce the edge lettering and that the "delivery of the tooling, preparation of the dies, required testing and evaluation will require several months." The authorizing law does not provide specific guidance on how the edge inscription should read, giving the Mint some flexibility in designating their anniversary issuance. The U.S. Mint’s series of America the Beautiful Five Ounce Silver Coins have smooth edges with lettering. This photo shows the incused edge letterings on 2015 Blue Ridge Parkway America the Beautiful Five Ounce Silver Coins. The Mint expects to have the proof and uncirculated editions ready for sale by the summer of 2016. 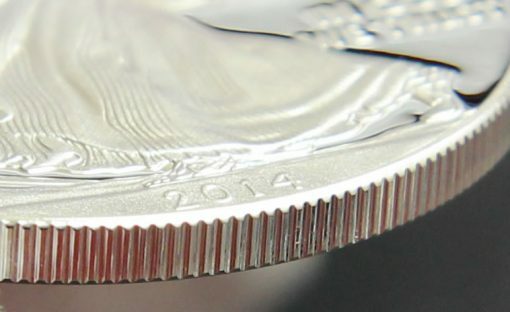 Bullion versions for next year will retain the traditional reeded edges. The U.S. Mint will actually start striking those next week and they will be offered to its network of authorized purchasers beginning on Jan. 11, 2016. The FAST Act includes other coin related provisions that CoinNews will discuss later, like moving from 90% silver coins in proof sets to at least .999 fine silver coins and giving the Treasury Secretary the authority to strike one-ounce coins in .9995 fine palladium. $53.95 for the proof and $44.95 for the uncirculated.